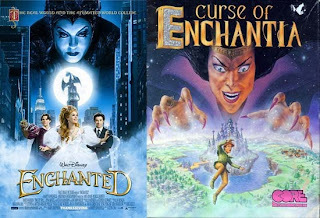 Someone e-mailed me this link pointing out the similarity between Disney's Enchanted and my box cover for Curse of Enchantia, the first game I worked on way back in 1992! I'd say it was pure coincidence, except perhaps for the way they copied the little swirly connecting bits in my font. I guess it could be a case of Art imitating Disney imitating Art, since I was definitely inspired by the witch from Sleeping Beauty in the first place.